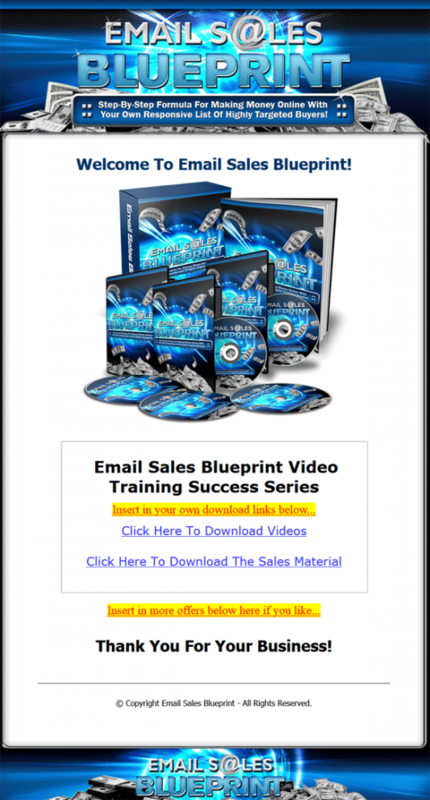 Email Sales Bluprint PLR Videos is your easy door to the Profitable Email Marketing niche. Includes Private Label Rights. Edit, change or Resell. 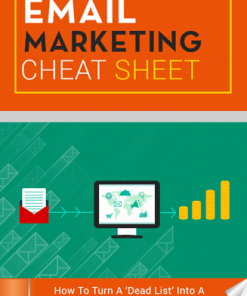 Like I need to remind you that email marketing is one of the biggest money making niches on the big ole net. But like so many things, most marketers struggle to build a list and few make money from their lists. Here is your opportunity to grab your share of this huge market. Video Files – 20 quality email marketing and list building MP4 video files. they include a professional male voice over. Since they come in MP4 format, you’ll know they will be easy to use. 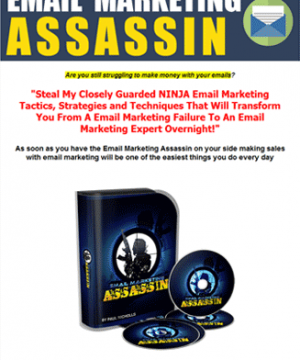 Reseller Kit – Everything you need to resell the Email Sales Blueprint PLR Videos product including a quality sales page and matching download page. Simply add your payment link and your download link, upload the two web pages and it’s ready to make you can on automatic. 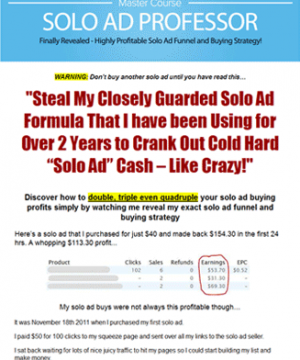 Squeeze Page – Build your self a this highly popular and highly profitable niche. All you need to do is copy and paste your optin code into the page, upload and it’s set yo build you a list on auto-pilot. Comes with a matching download page as well. Give Away Report – 21 page Report entitled, “Profit List Building”. Even comes in Word DOC format so you can edit or change it anyway you want. Autoresponder Messages – Along with the give away report, you’ll also be getting 10 pre written email messages you can send to your new list. No struggling to write emails, we’ve done the work for you. All in DOC format. Email Swipes – All kinds of marketing material here including, Forum signature, Text Links, PPC Ads and Solo Ad. All in one convenient text file. Source Files – Image PSD’s for banner, combination, flat, mini site template and CD template. The easy way to brand this package as you own. 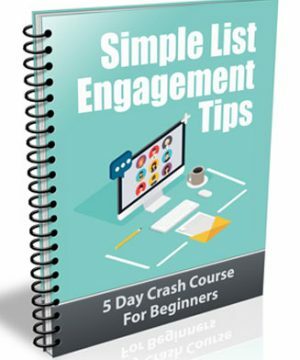 Do you get frustrated when you build your list but don’t make any sales from it? Do your subscribers look forward to receiving your emails each day? Do you get irritated when you spend hours creating great content, only to have people unsubscribe from your list when you send it to them? Or maybe your subscribers do open up your emails, but when it comes down to it and you ask them to buy from you, they lock up their wallets? From Your List Instead Of Just Wasting It? How would it feel if you knew exactly how to get your subscribers to open up your emails all the time and look forward to hearing from you? What if there was an easy way to get your subscribers to want to buy from you again and again? 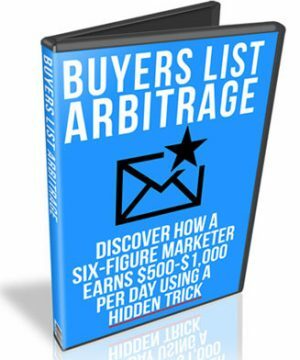 It’s Not About Just Building A List… It’s About Building A RESPONSIVE & PROFITABLE List! What you want are subscribers who actually WANT to buy from you! If you want to get the most from your list building efforts, then it’s time for you to finally discover how to have the responsiveness and profitability you have been looking for. It’s time for you to finally start making more sales from your email marketing campaigns! 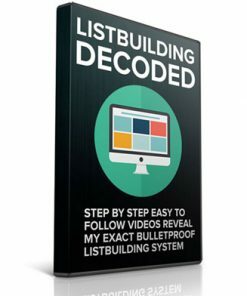 Email Sales Blueprint PLR Videos simplifies every single aspect associated with building a successful list and can give you an instant boost in income! Unless you focus on building a responsive list, no matter how much effort you put into advertising your business, you will NEVER come close to making as much money as you can with email marketing. Just one email sent out to a responsive subscriber list..
A single click of your mouse and your automated cash machine kicks into high gear and begins to drive in steady, ongoing profits! 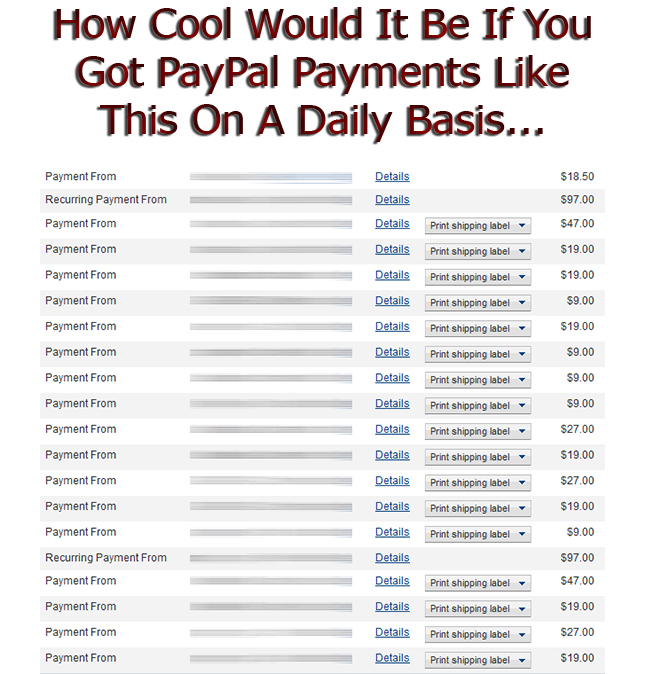 It’s the fastest and easiest method of making money online, even with ZERO experience! 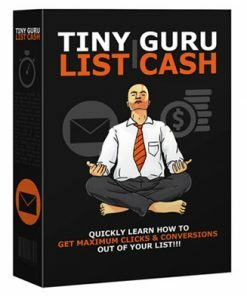 When you actually begin building your list the right way, and you experience, first hand, just how incredibly powerful this actionable system really is.. I guarantee you will not go back to tedious, time consuming and outright expensive “manual marketing” methods again! With 20 Email Sales Blueprint PLR Videos modules, you’ll have what you need to make money with your own responsive email list, even if you’re starting from scratch with no experience! Email Sales Blueprint you the proven strategies used by successful marketers to take your business to the next level, just by following along as you’re guided every step of the way. All you need to do is follow along with me, replicate my system, and starting from now you will have a hyper-active mailing list at your fingertips! Best of all we’re offering you a complete, step by step Email Sales Blueprint PLR Videos system that is so simple and effective there’s virtually ZERO chance of failure! 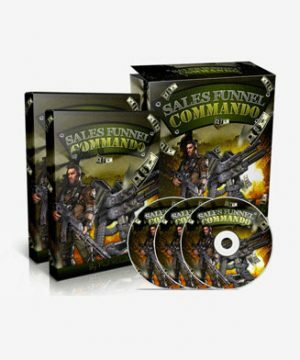 You’ll Get The Turnkey ‘Lead Generation’ Sales Funnel With This Professional Squeeze Page! …but attempting to master this system on your own can be quite expensive, especially if you don’t know what you’re doing. For a fraction of the cost, you can pick up your copy of Email Sales Blueprint and save yourself thousands by learning real world tips and tricks not being taught anywhere else. When for a small one time entrance fee you can have all the training and resources necessary to be turning a profit quickly. By now it should be easy for you to say YES based on what I’m offering to teach you, along with the insider tips and tricks you’ll be receiving, which are worth the price of the entire course all on their own. So click the button below and join me on the inside. 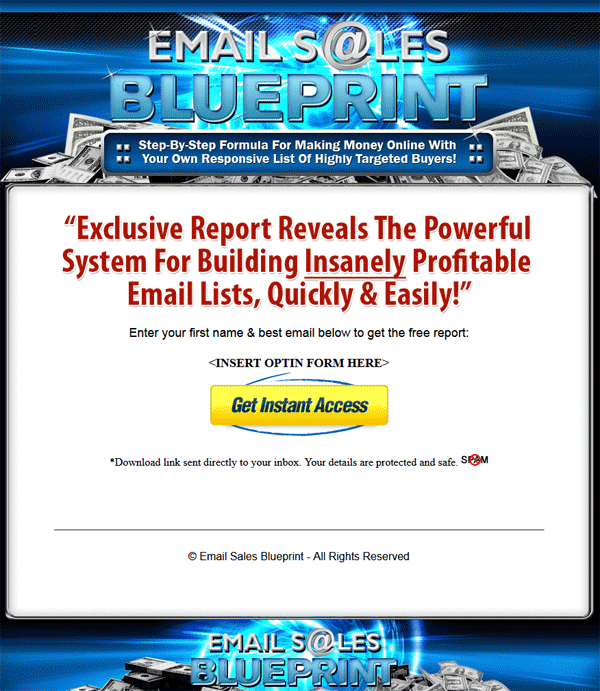 Email Sales Blueprint is loaded up with everything you need to get started the right way in as little time as possible. But is simple enough you can go through the entire program in just a couple hours and be getting results tonight! P.S. Don’t delay! This system is so complete we’ve had to separate each segment into 20 high quality videos! Once inside, you’ll be able to download and watch them online at your convenience. P.P.S. You’ll be racing to try out this system because everything is SO clear! I don’t know how long I’ll be offering this much value for such a low price, so go ahead and get your copy now while its fresh on your mind!